What the F Happened?how to keep warm Archives - What the F Happened? Click Here because the two eggs have hatched. The baby eagles have arrived! Click Here Baby eagle DC4 is rescued and returned to the nest! Here Ye! Here Ye! My Pet Eagles laid their first egg of the 2017 Mating Season! 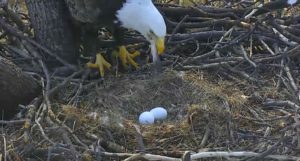 DC’s Mother Eagle laid an egg (DC4) on February 19, 2017, at 6:24pm EST. It was exciting to watch her in labor and lay the first egg of this mating season. 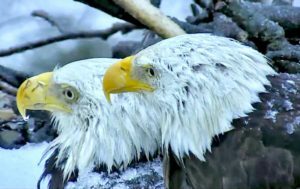 These magnificent birds became My Pet Eagles last year when I heard on the news that the American Eagle Foundation (AEF-DC) announced the hatching of last year’s eaglets DC2 (egg #1) and DC3 (egg#2) of the 2016 Mating Season. In 2014, this Eagle couple selected their nesting home in DC’S National Arboretum located on New York Ave, NE, 100ft high inside of a Tulip Poplar Tree. Eagles mate for life. My Pet Eagles were named, Mr. President (Mr. P) and The First Lady (TFL). 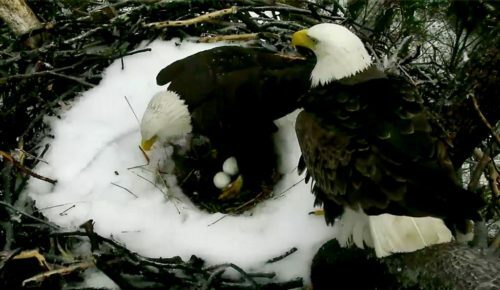 In 2015, Mr. P. and TFL, laid, hatched, and raised their first Eagle (DC1). 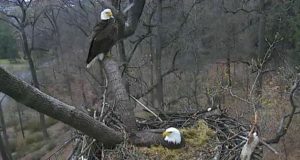 With the help of the US Department of Agriculture and other government and corporate sponsors, TEAM AEF-DC was organized to create and manage an interactive website complete with two cameras that provided 24-hour CAM service that allows people like you and me from all over the world, to use this amazing technology to watch and learn about the American Bald Eagle. In 2016, they became My Pet Eagles when they laid, hatched, and raised two eagles (DC2 and DC3) that later were named Liberty and Freedom. This couple are perfect examples of what and how a monogamous relationship should be and a prime example of how a committed relationship can exist. They mate often. They love each other. They share duties in managing and keeping the nest. They hunt together and eat together. They take turns rearing their young; while one parent sits in the nest, the other one is out hunting and bringing food to the nest. Once mated, they lay eggs around the same time each year. My Pet Eagles lay their eggs mid-February. The hatching begins mid-March. Once hatched, these two magnificent birds will instinctively take on the awesome tasks of feeding, discipline, teaching, and preparing their babies to leave the nest and start a life of their own. The American Eagle Foundation team performs educational services for people like me to learn all about the Eagles and their behaviors. 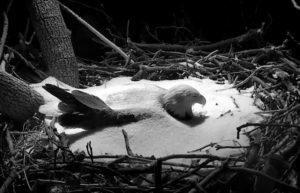 The AEF NEST CAMS are strategically in place around the nest complete with sound activated with infrared night vision for our viewing pleasure 24-hours; 7 days a week. 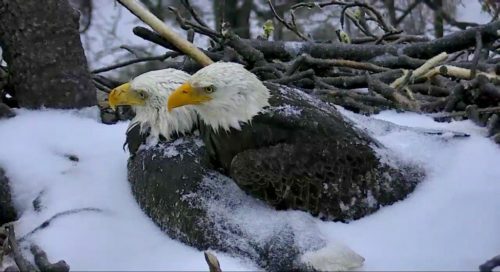 The parenting activities started tonight (2/19/2017) and will end sometime around mid-July when the baby (eaglets) take flight to leave the nesting place they knew as home where Mommie and Daddy provided three meals a day, warmth, safety, and the training they needed to live a self-sustaining life. I am not an educator. I am not a professional at “Eagleology”! I am a citizen caught up in the excitement surrounding these awesome creatures and I want share them with you in hopes that not only will you learn, but that you will share with your friends and family. I consider these two wonderful birds as My Pet Eagles. The work done by the AEF-DC TEAM makes my virtual experience easy and exciting. The first egg of the 2017 mating season was laid Sunday, February 19, 2017, the eve of President’s Day, at 6:24pm, EST, caught live on camera. Monday, February 20, 2017, (President’s Day) Daddy Eagle will start his duties of providing food and protection for his wife and their new family. Protecting Home – Mr.P selected and built his nest in 2014. He and The First Lady have laid four eggs, so far, they have hatched three eggs, and have raised three eaglets. They have been preparing the nest for the next set of eaglets. Imagine you and your spouse are away from home for a few hours and the husband returns home only to find out that an intruder had entered your home, ate your food, and started rearranging the furniture. That is what happened when a sub-adult Eagle squatted in their nest. This video is 13-minutes long. When the intruder fails to heed Mr. P’s alerting sqauks to leave his nest, at about 9-minutes into this video, Mr. P flys into the nest to stare down the intruder. At the point that the intruder realizes that it is in the wrong place and decides to leave, Mr.P did a 360 drive-by and knocked the intruder out of the nest. At 11-minutes into the video, watch as the AEF-DC video master, replays Mr P’s swift attack in Super Slow Motion. That bird will not intrude that nest ever again! Mr. P is truly a protector. Thanks “birdbrain56” of AEF-DC YouTube. Lessons Learned – Mr. P shows how much he’s learned about protecting his home, food, and family. I love this video. The couple is expecting. During the day, The First Lady spends time flying and perching in different trees. She watches her husband (Mr. P) as he hunts, bring large tree limbs into the nest to create a taller wall around the nest and to strengthen the border. The First Lady must eat more because she is expecting. This means that Mr. P is pulling double duty. He working on the nest, hunting for two plus providing prenatal care needs, and protecting his wife and his nest. (emphasis on story to give you an idea from my perspective of watching these two magnificent birds so closely over 24 months. Their behaviors and activities are instinctive and are worth monitoring and studying.) Watch this video closely. Mr. P brings enough fish for him and The First Lady to eat together. Once they enjoy the high protein meal, Mr. P starts to clean up the nest and rearrange the borders of the nest. The First Lady flies away for an appointment (emphasis on story about this couple to make watching these birds more interesting and fun). Thinking that The First Lady ought to have returned from her appointments, Mr. P returns to this nest with a freshly caught fowl. This fowl provides the nutritional supplements she needs to raise the iron, fat, and sodium she needs as an expectant mother that is close to delivery. But she’s not there. He looks for her. He is in the kitchen. He starts to prepare the meal by plucking the feathers. Rich blood from the fowl is everywhere. He decides to taste the dinner that he prepared for his wife. (THIS IS WHERE MR.P SHOWS US THE LESSON HE LEARNED FROM THE INTRUDER.) Once Mr. P realizes that The First Lady is not coming back anytime soon, he decides to go looking for her because he brought home and prepared a special meal for her and his unborn child. Watch what he does with the fowl. Instead of leaving it there like he did when he left the fish for her a few days ago that the intruder found and ate, this time he takes the specially prepared meal with him! The video is fast forwarded to show Mr. P and First Lady returning to the nest together. Amazingly, Mr. P still has the fowl that he prepared for her earlier with him as they land on the nest. He proudly presents the special meal to his wife. He flies away once he sees that she is safe and is eating. She starts eating and enjoying this tasty meal that her husband hunted, prepared, and protected just for her. This video is so important – because it shows how these two prove that the love, the marriage, and the commitment to parenting is real between them! Simply Awesome! What a lesson learned! 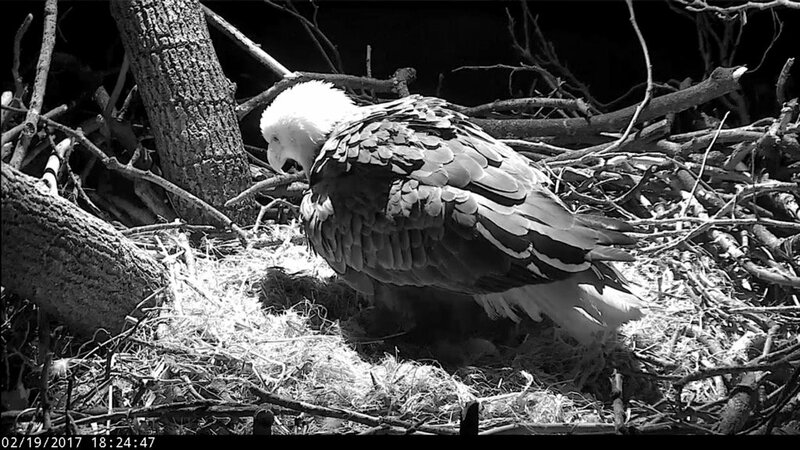 Daddy Eagle – Mr. President brings a huge tree limb to create a strong border around the nest. Watch his arrival and watch how he mounts that big branch. Watch how proud he is of how he mounted the huge branch showing off his skills to The First Lady. Wait for it, watch what happens to the branch, pay real close attention to Mr. P’s reactions. Watch First Lady look away as if she didn’t see a thing. You are going to laugh until you cry. Very Funny. Couple shares a big fish. How to tell the difference between Mr. P and The First Lady.Nesting, eating, loving playing, working, and mating. The First Lady lays the first egg of the 2017 mating season, February 19, 2017, at 6:24pm. Watch this closely. The First Lady goes into labor, Mr. P comes to her aid. He tucks her in, pats down the nest, and makes sure she’s ok. He flies to the overhead branch to protect her during her labor pains, which makes her vulnerable. Listen to her gasp and groan. Watch the feathers expand on her back during the labor of laying the egg. This eaglet will be called DC4 when hatched because this is the 4th egg this couple has laid. What an awesome experience. To learn more about this couple, go to http://dceaglecam.org . There are two CAMs that you can switch between. Not only can you hear all of the natural sounds of the nest, you can hear street noises, sirens of first responders, and low hovering air traffic. Please share with young children, the sick and shut-in, teachers, and people battling depression or with someone who need something positive to cling to. Do what I did when I got sick and need something external to uplift me…make these intelligent grand birds My Pet Eagles. It will take 30-days for the egg(s) to hatch. Once they do, the activity in that nest will be so educational and so fun that I promise you; you will want others to know and learn what you are experiencing. Get connected. This couple could have more than one egg. Be on the lookout for DC5 or maybe, DC6. REMEMBER THIS IS A WILD NEST. Anything could happen. My purpose is to share with you so that you will share with others. Content, pictures, and videos copyright of American Eagle Foundation. Thanks “birdbrain56” of YouTube for the great work you do with the AEF-DC videos. I am working to bring about awareness about the Eagles and to drive traffic to the social media and web sites to support the American Eagle Foundation. UPDATE: SECOND EGG HAS BEEN LAID. Mate for life by repeating all the activities of the mating seasons until they die! If only we humans understood the kind of love and respect that naturally keep the “until death do us part” commitment seriously. I already had respect for why America selected the Bald Eagle as its PATRIOTIC Bird; however being exposed to the awesome knowledge and teachings of the AEF-DC Team and watching these birds real time, interact, and survive in the wild takes monogamy to a level times ten. I love My Pet Eagles. Do you want to know how My Pet Eagles faired during Winter Storm #Stella? Watch video recorded at 3:30am. Watch the video on how they wake up after the storm around 7:30am. 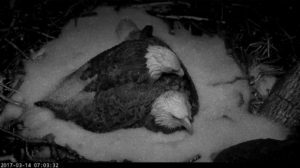 Love birds snuggling to keep warm during the freezing rain of Winter Storm Stella 14Mar17 – True commitment! Mr. P and TFL inspects their eggs the morning after Winter Storm #Stella 14Mar17. Mr. P flies away for food. Note: Unless there is another major event, this will be the last update to this post. I will start another Blog Post when DC4 hatches sometime around mid-March. In the meantime, ENJOY! UPDATE: DC4 Hatched 29Mar and DC5 hatched 30Mar17. CLICK HERE to follow the next phase of their lives.